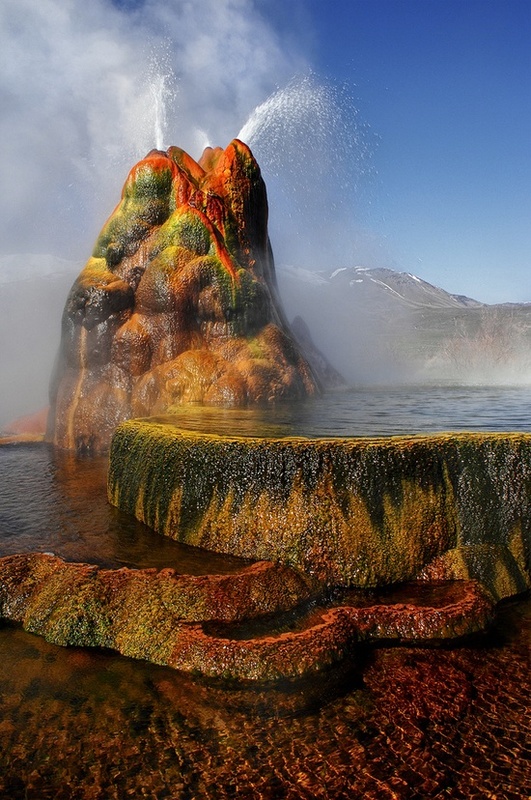 Fly Geyser, also known as Fly Ranch Geyser is a man-made small geothermal geyser located in Washoe County, Nevada approximately 20 miles (32 km) north of Gerlach. Fly Geyser is located near the edge of Fly Reservoir and is only about 5 feet (1.5 m) high, but 12 feet (3.7 m) counting the mound on which it sits in 2013.Fly Geyser is located on the private Fly Ranch in Hualapai Flat, about 0.3 miles (0.48 km) from State Route 34.The ranch is currently owned by Todd Jaksick.There is a high fence and a locked gate topped with spikes to exclude trespassers. The only access is a dirt road, but it is large enough to be seen from the road.